Last March 9, I attended Watsons Beauty Lab at the posh restaurant 2nd's at Bonifacio high street. I ran a litte late but still got there early enough to have a little chat with the Watsons team together with Depot's EIC Rumples Estacio. Earth of earthlinggorgeous was also there--yey to 1 familiar face. Hehe. We were treated to a delicious merienda first and some refreshing drinks. After a few minutes the actual presentation started. So basically, the team just presented Watson's new line: Pure Beauty. It was really quite interesting as there were many products that caught my fancy. The first one they presented was their "Beauty Within" section and products. This new section advocates that beauty and wellness go hand in hand. It offers slimming, whitening, anti-aging, and skin enhancement vitamins and supplements. It's a one-stop shop for everything a woman needs to be able to reveal true beauty from within. Next was Pure Beauty. It was divided into 3 sections: Black Pearl, Haircare Treatment & Skin Brightening. PURE BEAUTY Youth Restore with Black Pearl is the luxury anti-aging skincare line from Watsons that provides special treatment that counteracts dryness, erases signs of wrinkles, creates luminosity and provides radiance for younger looking skin. The secret lies in the natural goodness extracted from rare black-lipped pearls found only in Tahiti. This line has 6 varieties - essence, night cream, day cream, foam cleanser, eye cream and a toner. PURE BEAUTY Haircare Treatment line caters specifically for Asian hair and the modern women’s busy lifestyle. All products from this line are enriched with Japanese Camellia Seed Oil, a well-known natural source of powerful anti-oxidants and rich in Vitamin E, the formula is nourishing and intensely moisturizing. The Haircare Treatment range is made up of 5 products-- shampoo, conditioner, hair mask, essence water, haircare oil. VERDICT: I've tried most of the products above and I do attest to the quality and effectiveness of each one of them. I've switched to Pure Beauty, seriously. Mich is obsessed with the haircare oil! Watsons newest line of whitening products is PURE BEAUTY Super Brightening Skincare. 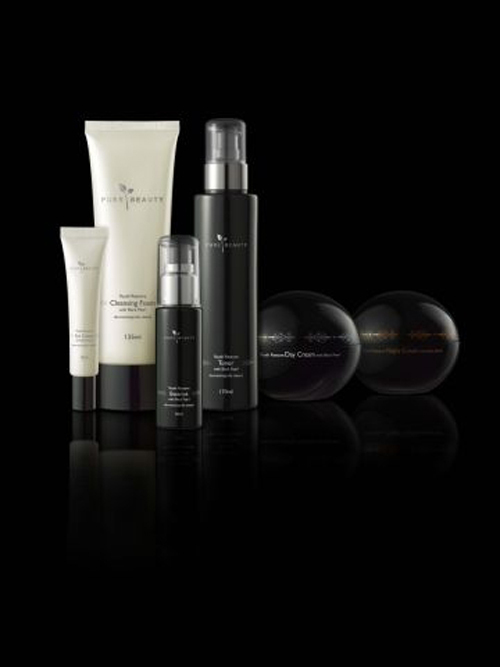 It's a collection of products, which combats aging and darkening of skin. The line offers natural whitening care for long lasting brightening effect and radiant flawless skin. It is made of White Flower Complex, which includes white rose, lotus and freesia extracts and has anti-stress properties. These new products carry six varieties, namely the multi cleanser, toner, eye gel, essence, day lotion, day lotion with SPF 15 and a night cream. VERDICT: I haven't tried everything, just the eye gel and facial mask, and they're also effective. I love how Watsons do everything to bring in new innovations in the beauty market! After the event, I headed to SM Cubao for some "me" time and also to take a peek on their shoe section. Hehe. Found some promising buys. But I'm so proud of myself for not giving in! ang awesome ng hair oil. my hair feels awesome! :D i'm planning to hoard it. super cute nung last shoes!!! All the while, I thought I am the only person who loves SM Cubao. I also regularly dropped by the place because it is not highly congested as compared to other malls. What camera did you use in this post?